Sciblogs | Advertising campaigns: homeopathy or a sceptical series? 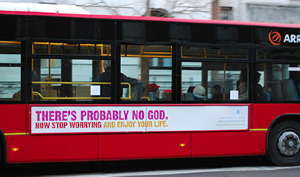 The atheist bus campaign has me thinking… what if there were a similar campaign against homeopathic remedies? Or an on-going series of advertisements questioning dubious practices of all kinds? Fridays are good for day-dreaming, right? It strikes me this is strategy where the advertisers more-or-less can’t completely lose. If the advertising company pulls out, the withdrawal only attracts more attention! Topics? More that you can cover with a sack of healing crystals. Q: How does homeopathy work? Answer: it doesn’t. Homeopathy. There’s nothing in it. Ginko Biloba… how do I remember thee? Remedies without supporting evidence: that’s wishful. You could be more serious about it all and have ’genuine’ slogans (’You want supplements? Have a healthy diet.’), but this is for a little light relief and entertainment. This is a Friday end-of-week post, after all. Hat tip to Orac for the posting the example homeopathy slogan. I’m just putting this out as a stop-gap while I write a few more substantive posts that will take a bit of time to reach readers… this is a rather feeble little blog post without much real connection to science… my humble apologies and all that mumbling stuff. Weird. The scheduling went wrong, this isn’t supposed to be out for a few more hours. My mistake or a bug in WordPress, but either way: sigh. Chiropractic, A Cracking good time! Chiropractic, what a pain in the neck.